Just when she can’t take it anymore, Leta finally catches a break. But when things seem too good to be true, they often are. Finding her dream job went right out the window when Leta Breckenridge had to quit school to help care for her mother suffering from dementia. When a delinquent account may force her mother into a less desirable facility, Leta is thrilled to land a high-paying job at an Austin public relations firm. But her seemingly ideal job turns into a nightmare when she learns the firm is a front for a political opposition organization–and that the research she’s been collecting will be used against Nathan Emerson, the handsome senator she’s swiftly falling in love with. Nathan is a rising political star being pressured to run a bid to unseat the current governor of Texas. He’s already in a relationship with a woman much better suited to be a politician’s wife, but he’s never met anyone like Leta. Could this feisty woman hold the key to his heart–and his future? What Matters Most is a relevant, ripped-from-the-headlines story that charmed me from beginning to end! From the struggles associated with dementia to the drama of the political arena, Kellie Coates Gilbert deftly brings her characters and their emotional stories to life. Leta Breckenridge is a heroine readers will champion, and her Cinderella story warmed my heart and left me smiling. 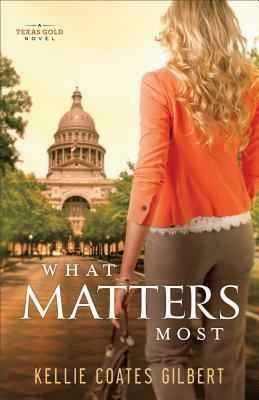 Rife with drama, deception, and romance, What Matters Most is a must read for fans of compelling women’s fiction! As a former legal professional, Kellie Coates Gilbert spent nearly twenty-five years working in courtrooms and behind the scenes of some of the largest and most well-known cases in America. She was one of the lead paralegals in the Jack-in-the-Box litigation, where uncooked hamburger resulted in the deaths of several toddlers and made many more critically ill, which is the subplot of Where Rivers Part, the second novel in a collection of contemporary women’s fiction stories all set in Texas. Her books not only explore the heart issues that matter most to women, but often allow readers an inside peek into her former legal world. 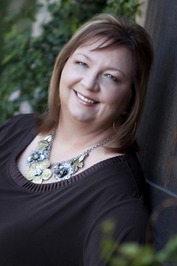 To learn more about Kellie and her books, please visit her website.